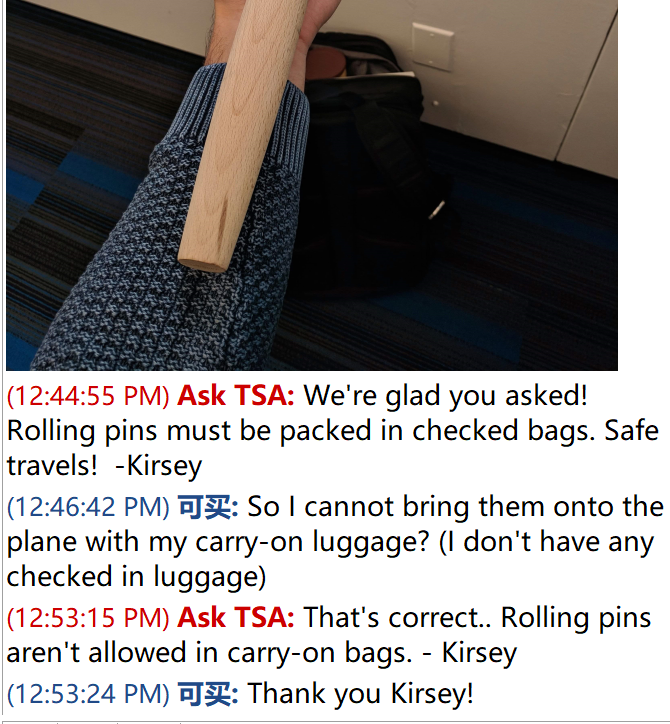 Can I bring a wooden dough rolling stick onto the plane(carry-on)? Here is a picture of what I am trying to bring onto the plane. I thought since it is wooden, it might pose a threat. I'd really appreciate any help. Flying from LGA, NYC, and I do not have any checked in baggage because it is Basic Economy flight. I asked https://www.facebook.com/AskTSA and they've told me that it is not allowed in carry-on bags. (12:53:24 PM) 可买: Thank you Kirsey! If you don't mind risking losing it I would take it with you anyway. The worst they are likely to do is confiscate it. If they decide that is what they want to do accept it to avoid further escalation. 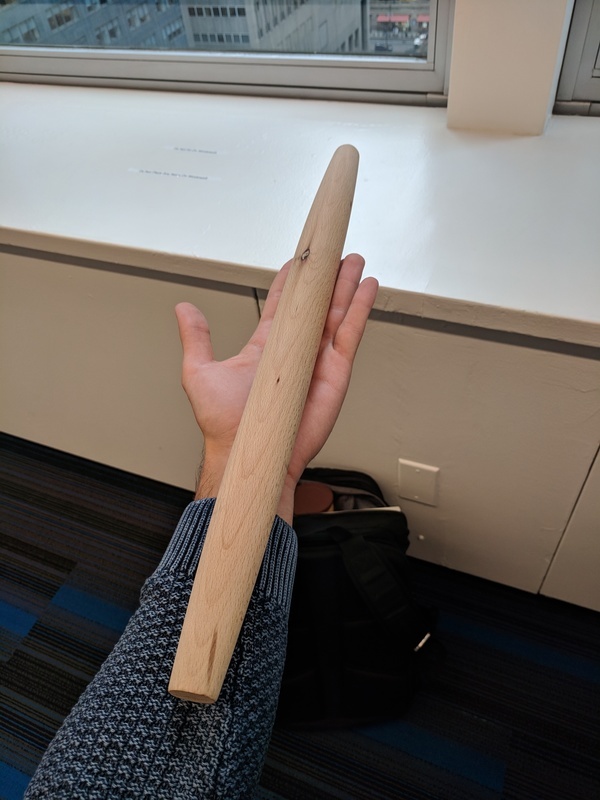 I once flew with a piece of 1-inch diameter steel bar stock a foot long out of Stansted, London, UK, as I was going to see a friend in Spain who had a lathe and I didn't want the hassle of obtaining the item at my destination. I was upfront about it: I placed my bag in the tray for the scanner, with the bar unpacked beside it. The tray was inevitably selected for further inspection. The security guy politely asked me why I was carrying the item. Convinced by my story and my non-threatening demeanor he called his supervisor. After the further pleasant conversation, they allowed me to keep the item, for which I thanked them. I'm sure if I asked an official advice line if that kind of item were allowed they would tell me no. But I got lucky on the day. For a low-value item, it can be worth taking the risk. The most similar item listed seems to be Nunchucks which are prohibited in carry-on bags. Images of nunchucks. I'd say, from experience, the odds of it passing through the terminal entrance are 20%, and that would be if the screener didn't really notice it. Not the answer you're looking for? Browse other questions tagged air-travel airport-security hand-luggage tsa prohibited-items or ask your own question. Can you bring a standard tube of toothpaste on a plane in a carry-on bag? Can I bring a big wooden sword as carry on in a plane? Is it possible to check in plastic storage boxes on an Air Canada international flight? DIY computer in hand luggage - what to expect on security checks? Can I carry contact solution onto a plane that is more than the 3oz limit? Can I bring a cheese plane in carry-on? Am I allowed to bring an unopened wine bottle in my carry-on luggage onto an airplane?